Knowing how to sew does not make teaching it easy. So much has come up in my first 6 weeks of classes that I never saw coming. First is that the students have no idea how long something takes to sew. Professionally I did time estimates so I could keep in budget for each production. That was assuming I had skilled labor. When I mention those estimates now the students tell me it is too long and I need to show them a faster way. I explain that 4 hours of class time (one month) is equivalent to half a day of work. So a blouse will take at least two months if they do not want to sew at home. That includes cutting out, sewing and finishing seams, pressing, etc. I actually asked one student to get a refund today, since I couldn’t help her. She wanted to bring in alterations a dry cleaner was paying her to do, and do the work in class. The first class of the month she took all the class time because the alteration was putting an invisible zipper in an embroidered dress, matching the motifs on each side. Today in her second class she wanted rolled hems done on the serger. It would just take too much time to set everything up in an hour class with 3 other students who also need a great deal of help. I know she was disappointed. I think she needs the work. One thing I really need to work on is getting the students to read their pattern instructions. I was just telling them how to do each step, as quickly as possible. Now I realize that they are not thinking about why each step is done, just doing it. Since they are paying for a class and not just a finished garment, I need to slow down the work so the students have time to mentally process what they are doing. I think this will be the hardest part of teaching sewing. The new Threads magazine came out last week. 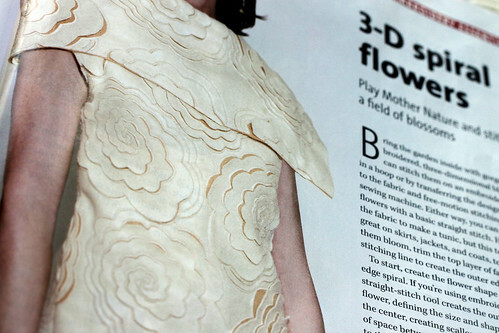 I really liked the 3-D spiral flowers on this top. I wonder how long it took to sew them? This entry was posted on Monday, September 14th, 2009 at 3:00 am and is filed under Sewing. Tagged: Sewing. You can feed this entry. You can leave a response, or trackback from your own site. Even though I spent years teaching school, and still substitute teach occasionally, I can’t imagine teaching sewing. Looks like you’re handling it well. I’d like to be in your class. To be an instructor is to have incredible patience! I agree with the above comment…you are handling it well. I taught a few quilt classes at my shop when starting out…money was too tight to hire instructors for at first. The situations encountered now make me giggle, but at the time, caught me totally off guard. You always get the new one who didn’t know a s.m. needle needs frequent changing to a student who will try to take over the class because she has a better way. LOL Such challenges help us to grow, right???!!! I can tell you are a first class problem solver though…what an innovative approach to get that artist canvas home – bet your hubby was delighted!! You are such an amazing teacher! I wish I didn’t live on the other side of the country – I’d love to take your classes.